Certain moments are not mere ticks in time’s unending progression but rather chasms, separating realities. August 6, 1945, at 8:15 AM, when the U.S. dropped an atomic bomb nicknamed Little Boy here, was the precise instant that mundan­ ity transformed into hell. A renovation of this museum’s East Building conveys that calamity in 20,000 square feet. Visitors pass from scenes of life before the bomb, through a doorway in a wall representing the instant of detonation, and into a dim room covered on all sides by panoramic photographs of the devasta­ tion. “You go through that wall, and the horror is right there before your eyes,” design director Toshitake Tanaka says. 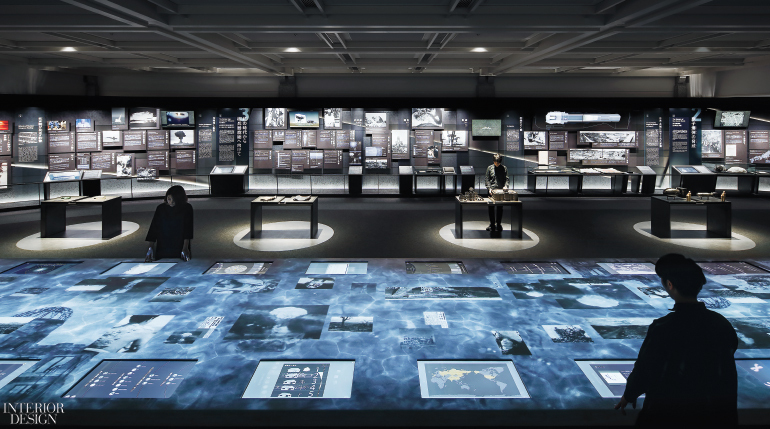 At the center of the room sits a model of the city, 16 feet in diameter and entirely white, onto which computer graphics and aerial photographs of the bombing and its aftermath are projected. Tanaka says he took a new approach to the exhibits: “To get people to think about how everything can vanish instantly with a single nuclear explo- sion, I added spatial experience and appealed more deeply to emotion.” There are also interactive media tables that highlight the risks of nuclear weapons as well as the city’s recovery. In fact, the museum’s original building was part of that recovery—an architectural icon completed in 1955 by Kenzo Tange.